This website was designed to provide important information concerning micropigmentation and permanent makeup procedures, to help you make informed choices. Please feel free to read through the "Benefits" of the procedures, the "FAQs", view the "Before and After Photo Gallery," read "Client Reviews," and Ms. Morton's credentials. Ms. Morton has been a licensed cosmetologist and certified paramedical esthetician, registered with the Colorado State Board of Cosmetology since 1990. She has been a certified micropigmentation specialist since 1993 and was the first fully licensed and certified permanent makeup artist in the state of Colorado. After thoroughly researching numerous permanent makeup training facilities, she chose to attend the LeMor Micropigmentation Institute in California. This facility provided a 132-hour training course that was equal to or surpassed the medical standards she already practiced as a paramedical esthetician. It also educated her in the color and technique aspects of permanent makeup procedures with practical training on live models. Denver cable TV station, CAN or Consumer Advantage News, featured Ms. Morton performing a live eyebrow procedure on a segment entitled "Women's Beauty. Ms. Morton's background also consists of makeup artistry for runway fashion shows and professional modeling portfolios. 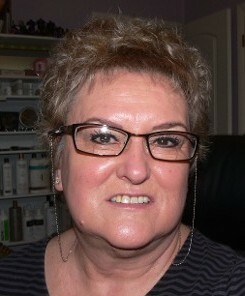 She has been a certified Look Good...Feel Better volunteer, providing makeup applications and lessons for cancer survivors. She has also worked as a publicity photographer for WQLN television in Erie, PA as well as a freelance photographer. 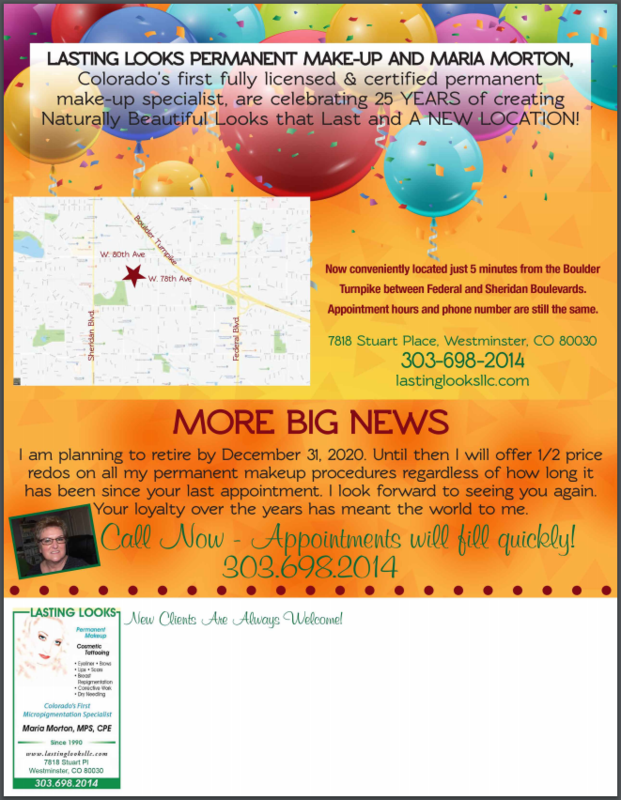 Ms. Morton is the sole owner of Lasting Looks, LLC, registered in the state of Colorado since 1993, with an office conveniently located five minutes from the Boulder Turnpike, between Federal and Sheridan Blvd. She is a past member of the Society of Permanent Cosmetic Professionals and a current member of the Conventional & Cosmetic Tattoo Association. Ms. Morton's training, years of experience, professional attitude, sterilization procedures, makeup artistry, and eye for detail, have made her one of the leading micropigmentation specialists in this country. All clients are seen by appointment only to address individual needs fully. If you have any additional questions or would like to make an appointment, give us a call today. are celebrating 25 years creating Naturally Beautiful Looks that Last. Located in Westminster and serving Boulder, The Denver metro area, all of Colorado and beyond.